Under interim coach Doug Weight, the Islanders have turned their season around entering today’s match at Columbus 12-4-2 in their last 18 games. AP Photo via Getty Images courtesy NYIslanders. When the Islanders visit Columbus this afternoon, they’ll look to continue their superb play under interim coach Doug Weight. Since he took over for Jack Capuano, they’re 12-4-2. Dating back to a 4-0 shutout over Boston in Capuano’s final game on Jan. 16, they’ve won 13 of the last 19 to pull into the second wildcard just ahead of the Bruins. At 68 points with 28 ROW (regulation/overtime wins), they have 22 games left. Boston has 21 which is why they’re on the outside looking in. The Bruins have one more ROW with 29 and an identical amount of points. They have an advantage because they can also get in by beating out Toronto for third in the Atlantic. They’re tied in points with the Leafs having one extra game. The Panthers have 66 in 60 games, meaning they have games at hand. However, they only have 25 ROW which is the first tiebreaker. The Leafs have 27 ROW. Sending that message instilled confidence in the room. It was obvious that Capuano wasn’t getting through anymore. A good man whose time had come and gone. Every coach is hired to be fired. That’s sports in a nutshell. Sometimes, a team needs a change. Weight has provided that spark. He has the Islanders playing better hockey. Consider that over the current stretch that’s seen them win 12 of 18 with only four losses in regulation, they have outscored opponents 60-47. In fact, when they score three goals or more, they’re 11-1-1. When they allow two or fewer, they’re a perfect 10-0-0. Most impressive has been their play against quality opponents. Entering today’s game against the Blue Jackets, they’re 6-2-0 against playoff competition. That includes two victories over the Canadiens. One coming via a 3-0 shutout in Montreal. They also have beaten the Capitals, Blue Jackets and Rangers while splitting a pair with the Leafs. They’ve proven that they can play with anyone. A good sign assuming they make the playoffs a second straight year and third over the last four. It isn’t just all about captain John Tavares, who’s picked up his play. He has 20 points (7-13-20) in 18 games since Weight took over. He enters today with three goals and an assist over the last three in wins over the Devils, Red Wings and Canadiens. Dating back to a hat trick at Florida on 1/11, Tavares has 12 goals with 13 helpers for 25 points over the previous 21 contests. That is nearly half his season total of 23 markers and 29 assists for a team-leading 52 points. While the 26-year old franchise center has done his part, teammates have chipped in. Co-goal leader Anders Lee has continued to score while playing on the top line with Tavares and playmaker Josh Bailey. Lee enters with 23 goals and 37 points with a plus-11 rating. Bailey has complemented them well. He paces the team with 31 assists and ranks second in scoring behind Tavares with 43 points. Brock Nelson is fourth in scoring with 34 (13-21-34). The biggest difference is the play of Jason Chimera and Andrew Ladd. Huge disappointments in the first half under Capuano, both have picked it up. Chimera has suddenly become a goalscorer. Ten of his 15 goals have come since Jan. 13. He’s never been a big finisher but the 37-year old vet has great wheels. His speed has resulted in some big goals for the Islanders. He’s hit the 20-goal mark twice with Washington including last year when he produced 20 goals and 20 assists in 82 games. As for Ladd, he was given a big contract by general manager Garth Snow to replace Kyle Okposo. A bust in the first half, Ladd has scored half his 16 goals in the past 14 games since Jan. 26 versus Montreal. That includes a pair of two-goal games including a big 4-2 home win over the Rangers on Feb. 16. He has four markers over the previous six. The 16 goals is respectable considering how poorly he started. But the six assists and 22 points in 56 games is way below what he’s capable of. A proven performer who was the former captain of Winnipeg, figure him to continue to play up to par. Another noticeable difference has been the play of Ryan Strome. While the former first round pick’s numbers of 11-14-25 are still disappointing, at least he’s contributing. Under Capuano, he was in the doghouse often getting benched or even scratched. Still not the best defensive forward, he does make mistakes like the costly icing that led to a game-winning goal in a gut wrenching loss to Detroit. Consistency is still an issue for the 23-year old who Snow selected fifth overall in the 2011 NHL Draft. However, he’s almost a point-per-game in February with 10 points in 12 games. A big improvement after being a non-factor in January. They are still without key checking center Casey Cizikas, who is out for a month. Stephen Gionta has actually been serviceable. 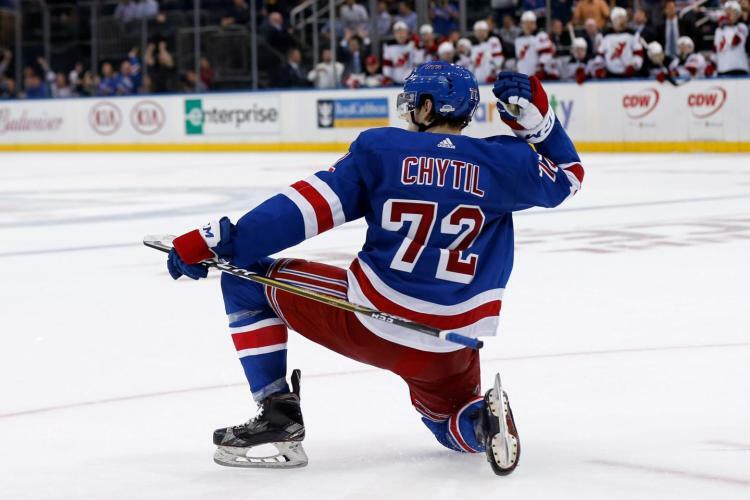 His best moment coming in the recent win over the Rangers when he stole the puck from Marc Staal and setup Ladd for a goal. Nikolay Kulemin has played a nice supporting role with 10 goals including a shorthanded goal in that same game. Rookie Anthony Beauvillier shows upside with his speed and maturity. Cal Clutterbuck just returned but has only played once. Weight has stuck with the current lineup. Defensively, they have gotten the job done minus Travis Hamonic. He was having a rough season before he got hurt. It’s mostly been the top tandem of Nick Leddy and Johnny Boychuk. Leddy again leads the defense in points with nine goals, 23 assists and 32 points while anchoring the blue line by averaging 23:02. Boychuk has been stellar lately going plus-10 with two helpers in the past five games. Four of which are Isles’ wins. Calvin de Haan continues to emerge as a reliable shutdown D who can block shots and move the puck effectively. Vet Dennis Seidenberg has been huge contributing 18 points and pacing the club with a plus-21 rating. Thomas Hickey remains dependable. Without Hamonic, the Isles have rotated Scott Mayfield and Adam Pelech. Thomas Greiss is really what holds it together. His steady goaltending since the organization decided to waive Jaroslav Halak has been instrumental. He’s won 20 games and posted a 2.43 goals-against-average, .920 save percentage with three shutouts. Without the steady 31-year old German vet, they would be nowhere. Jean-Francois Berube remains an unproven backup who has been sparingly used. The Islanders deserve a ton of credit for turning their season around. Even if the competition for the final wildcard is mediocre, they never gave up. Their experience should give them the inside track. This entry was posted in Column and tagged Anders Lee, Andrew Ladd, Brock Nelson, Calvin de Haan, columns, Dennis Seidenberg, Doug Weight, Islanders, Jason Chimera, John Tavares, Johnny Boychuk, Josh Bailey, Nick Leddy, Ryan Strome, Thomas Greiss. Bookmark the permalink.